Kunming is a large city but the good news is that it’s walkable. Hotels in Kunming are good value and plentiful, as a result you should find one within your budget. There are lots of good value hotels near the train station in Kunming, I’d recommend staying here especially if you arriving / leaving by train. 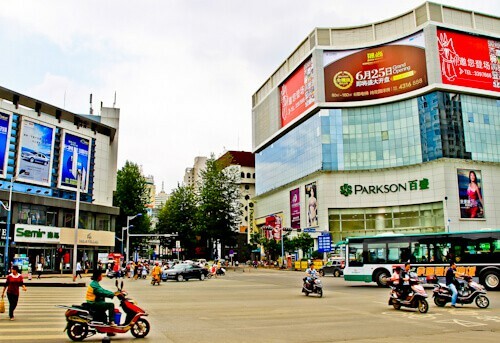 You can walk to the main shopping district of Kunming (above), various restaurants and the points of interest such as the Yuantong Temple and Green Lake Park. Yuantong Temple is a Chinese temple you should make a couple of hours to visit whilst in Kunming. The temple dates back over 1300 years to the Tang dynasty. During the Ming and the Qing dynasties the temple expanded to what it is today. In recent years the temple has been expanded more with funding coming from another Buddhist country, Thailand. Furthermore, In the lake around the temple, you must keep your eye out for water turtles, there are quite a few swimming about. It’s worth walking to Green Lake Park in the center of Kunming. 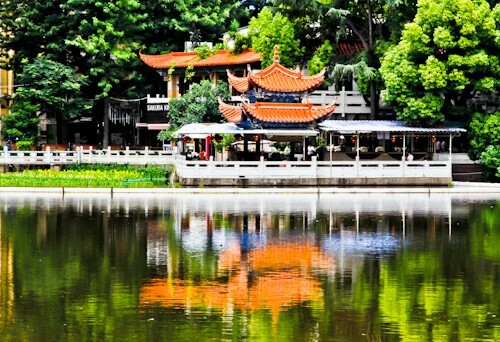 Although I thought that the lake in Yuantong Temple was greener than the lake in the park, as a result this really deserves the name ‘Green Lake’ more than the actual Green Lake itself! This park is to Kunming what Central Park is to New York City, for this reason it’s worth a visit. In addition, there are lots of well kept traditional Chinese buildings as well as bridges in the park making it the perfect location for photography in Kunming. If you have a week or so to spend in the Yunnan province then you must visit the historic Chinese towns of Lijiang, Dali and maybe even Shangri La in the mountains. Shangri-La is a city in the mountains of Yunnan as well as a famous hotel chain. I visited ancient Dali and Lijiang, I recommend you stay at least 1 night in each of these cities. Dali is a 4 hour bus ride from Kunming. Furthermore, Dali is an ancient Chinese city which is very well maintained and perfect for photographing. 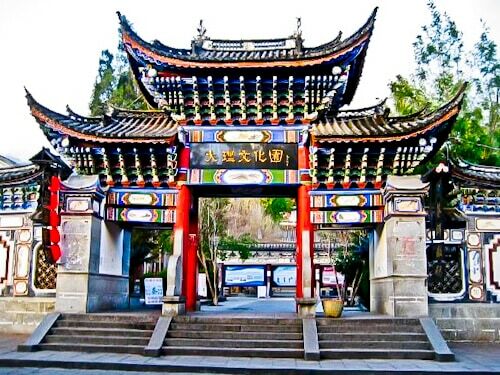 The ancient city of Dali is famous for the Three Pagodas of Chongsheng Temple, Dali Ancient City as well as Foreigner’s Street Central Square. If you want an authentic Chinese experience then I recommend you spend a day or two in ancient Dali. Lijiang is a 3 hour bus ride from Dali. In fact, the old town of Lijiang is a UNESCO world heritage site which makes Lijiang more popular than Dali, although I found them to be both as beautiful. A symbol of the old town of Lijiang are the water wheels (above). As a result you’ll see crowds of Chinese tourists taking selfies and Instagram photos around these wheels. Whilst walking around the old city you’ll see lots of buns being sold, these are known as Lijiang Stuffed Buns, I recommend you try one. They come in two flavors, minced ham or sugary. If you decide to go to Shangri La in the mountains it’s a further 4 hours away from Lijiang. This site is all about overland travel and this part of the journey overland from Kunming, China into Luang Prabang, Laos is not a famous overland route. There is talk about making a train line through Laos and Thailand, all the way down to Singapore but if you make the journey overland today you’ll have to take this bus (above). The journey from Kunming to Luang Prabang takes 24 hours and the good news is that you get a very small single birth on the bus so although it’s a little cramped you can stretch out. The bus stops regularly for bathroom and food breaks as well as to stretch your legs and get some fresh air. The good news about entering Laos is that you can buy your visa on arrival at the border. You’ll need to fill out a form, provide passport photos and pay from $30-$40 (depending on your nationality). It’s cheaper to pay in US Dollars, so buy some before arriving at the border. In Laos they speak a language very similar to Thai and I can speak Thai. I offered the Laos immigration officer $5 to stick the Laos visa on top of old stamps in my passport to save pages in my passport. He was very angry I asked him this and put the Laos visa on a new page. Enjoy your trip from Kunming to Luang Prabang Laos! The bus left Kunming in the evening around 6-30pm and drove through southern China to the border at night. Early morning was when we went through the border, first exiting China then entering Laos. The bus drove all day through Laos before arriving in Luang Prabang a little behind schedule at around 8pm. This is quite an adventure! 24 hour on a bus might sound boring to others but for me, if I have all the time, I wouldnt worry taking one to get to Laos. Though it will still be convenient for everyone if the train that they are planning will be done. About the visa, I will check if it will be the same for me. I would like to visit Laos as well and maybe do some backpacking around the area too. Thank you for sharing! Ok I can see why the Green Lake is called like this… I was now after reading your latest post very interested about the city Kunming – so it has an urban population of around 4,500,000 – that’s really pretty huge! Great and interesting post like always, James! Love to hear about these remote places of China! Sounds like a crazy journey to Laos though! Although, if there is one enjoyable and adventure seeking place to do it..it’s in Asia right haha? Can’t wait to go to Laos Mate! Will sure check how much it costs for Canadians and Australian to make sure we don’t get scammed haha! I prefer to visit destinations like Kunming. It’s easy to walk around and is not as crowded as popular cities. 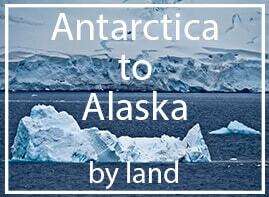 You’ve showcased quite a few great destinations that I cannot wait to try! 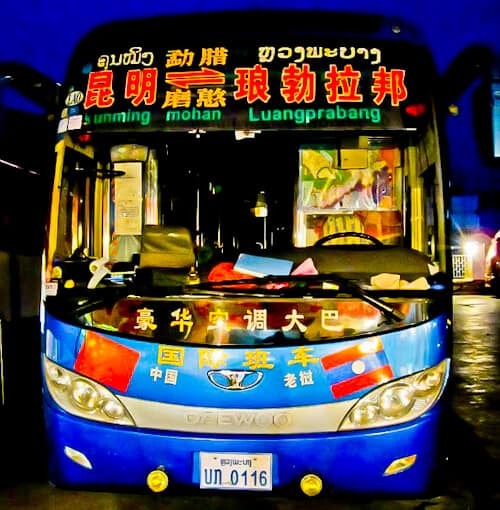 Never knew you could take a bus from Kunming, China to Luang Prabang, Laos! I bet it’s quit the experience. Hi, James, what a very timely article. I’m hoping to do some travelling around Asia next year, it’s always good to read about Laos visa regulations etc. it looks a colourful place to visit. I would not be able to cope on a bus for 24 hours. I haven’t been to Laos yet so the tips on the visa regulations will be helpful in the future. It’s nice to read about a part of China that is off the beaten track. Is Kunming near an airport at all or is it best to get there by train? I think the bus would be a challenge for me as I like to always be near a toilet! Yes, you can fly to Kunming airport. This is quite an adventure! the best way to get there is by train or by plane? would love to go there soon! Thanks! I was on an overland journey so arrived by train and left by bus. The easiest way to get to Kunming would be to fly into Kunming airport. Kunming looks like such a colorful city! I love the vibrant roofs and details of the temple structures, would love to capture this city. I was surprised to read that Thailand had contributed to Yuantong Temple’s expansion, very interesting. 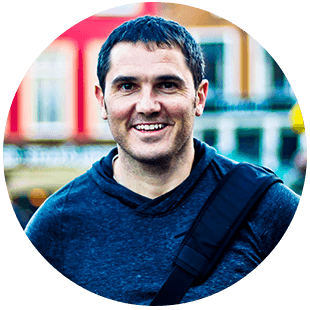 I’ve never been to China, but I love to hear about remote places, where the tourist doesn’t get his foot on. I have a good friend who’s been there and she’s been texting me about her trip there, and sending me photos, and reading your Kunming article makes me want to go asap! It’s on top of my bucket list by now! So interesting! 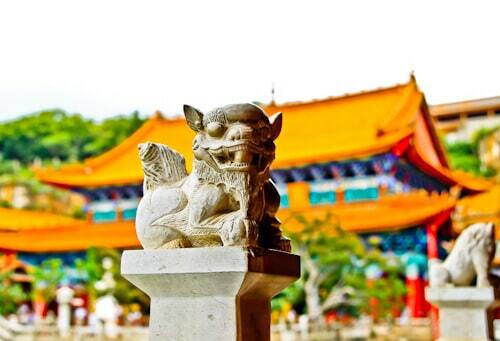 Yuantong Temple looks like a place of pilgrimage and has a peaceful atmosphere. It is good that you can buy a visa upon arrival at the border. I still cannot imagine traveling on a bus for 24 hours. I would be in so much pain probably because I cannot sleep well when I travel on a bus. I have never heard of Kunming but thanks to you, because after reading your beautiful post, I now see different beautiful offbeat destination. Overnight bus from Kunming to Luang Prabang is so colorful. 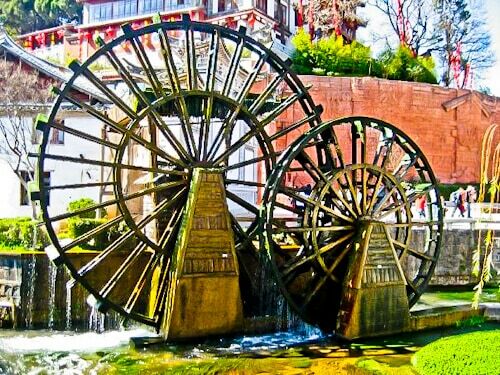 Water Wheels, Old Town of Lijiang, Yunnan is my favorite. Green Lake looks like a folk story of Chinese story. How much was the bus ticket from Kunming to LP? Going on December on land too. Hi Stephanie. I took the bus quite a few years ago and it was 387 RMB and took 24 hours. It’s probably a little more expensive now. You’ll need cash for the visa on arrival on the Laos border as well. Hey there, thanks for this article, super helpful. Do you know if you can purchase the visa with RBM at the border? Hi Dan, I can’t remember and I’m not sure. I’d take some US dollars just in case, in small bills. They’ll come in useful in Laos as well. Hi! How much was the bus from Kunming to Luang Prabang? Thanks! Hi Helene, the bus was about 400 RMB. This was a few years ago so it probably costs a little more now. Hi, This is amazing, actually live in Kunming and was trying to find a cheap holiday destination for spring festival. Overland travel is so much nicer and cheaper so I guess this will be perfect. what bus station did the bus go from? the south bus station? Hi Marlieke. I bought the ticket from an agency in a Youth Hostel in advance. Yes, the bus leaves from the south bus station. You’ll see a lot of lush jungle along the way, definitely a good experience! Hi Christine, I’m sure they’ll let you put your bike on the bus, probably underneath with the luggage.